Contrary to popular belief, Nathan and I did not get engaged for Christmas. We actually decided to get married on 11-11-11, which was our nine year anniversary. Looking back, I wish we had just told everyone right away. At the time, the idea of orchestrating a big holiday reveal seemed exciting, when in reality it ended up being a bit of a headache. But let me back up for a minute and tell you how it all came to be. For the last few years, Nathan and I had talked here and there about celebrating our ten year anniversary in 2012 by getting married. The closer it got to year nine, however, the less it came up in conversation. I wondered if I should bring it up - the one thing I know for sure about wedding planning is that it takes a lot of time, and the one thing I know for sure about me is that I like to make spreadsheets as soon as possible. And even though I am a feminist lady who has no problem asking my dude if he wants to marry me, I decided to hold off. It ended up being a good decision! Our anniversary was a Friday and we went out to dinner at Yosake, a fancy (for us) sushi restaurant in Wilmington. We sat down at a little table in the middle of the room, ordered half priced wine (happy hour is the most romantic hour of all), and then exchanged cards, because we're broke and had opted to forgo anniversary gifts. Nathan opened my card first. It was a cute card from Target that suited us perfectly, but in a generic, Target sort of way. I had written sweet things inside, but nothing truly memorable. Then Nathan slide an envelope across the table. I picked it up and opened it. It was a handwritten letter, on a piece of paper torn from a notebook. On it, he had written beautiful and loving things about me and us and our relationship, and at the bottom was a simple question. "Will you marry me? Circle Yes or No." "I don't have a pen," I said. "You can just say it outloud," he said. "Okay," I said. "I mean, Yes. Yes!" And that did it. We ordered second glasses of wine, stuffed ourselves on veggie sushi and Thai curry, and talked giddily about the fact that we were engaged, which seemed so weird and strange and real. There was no big public proposal (not our style) and no engagement ring (I was adamant about not wanting one). It was simple and sweet and perfectly us. For the next few days we didn't tell anyone about our plans. We finally called our parents, because they would kill us if they found out any other way, but we swore them to secrecy. We wanted to come up with a way to tell everyone that was different, fun, and exciting - a simple change of our relationship statuses on Facebook, or a mass text message, just wouldn't do. We finally decided to have our super talented graphic designer friend, Elma, create a Save the Date for us, and include it with our Christmas cards. We wouldn't get to see the surprise on the faces of our loved ones when the opened the cards, but we would have lots of fun imagining their surprise. As for the wedding planning: I still have no idea what I'm doing, but I asked for and received the book A Practical Wedding for Christmas and I'll be reading it cover to cover as soon as I get back to North Carolina. 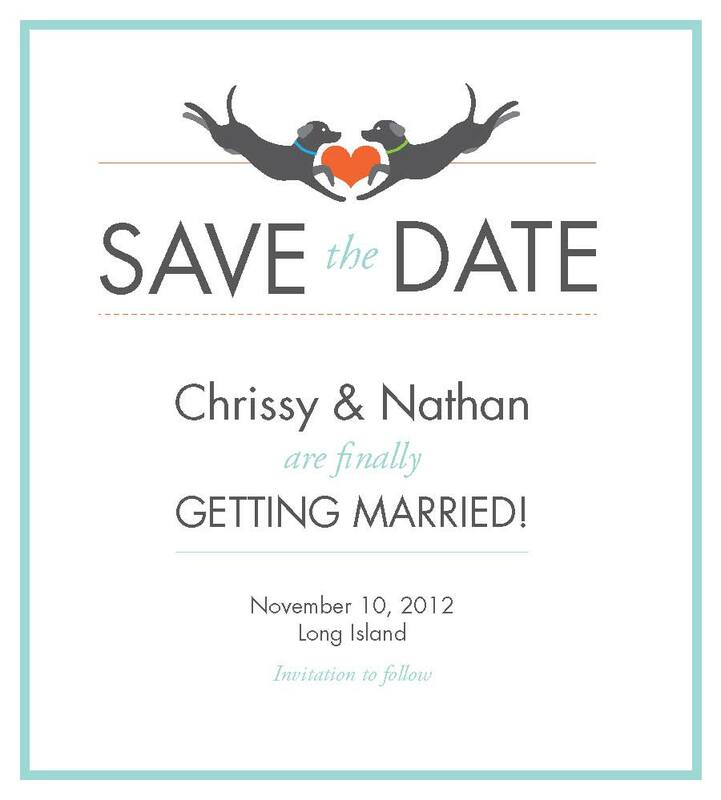 We know we want to get married on November 10, 2012 (technically a day before our anniversary, but it's a Saturday, which makes for a better party) and we know we want to get married on Long Island (I have a large family here and we have a lot of friends in New York). It will be a little hard planning a New York wedding from North Carolina, while going to graduate school full time, but at least I'll have the summer to do things like DIY my heart out. I'm also glad we're having a fall wedding - because it will be out of season, we'll be able to save quite a bit of money, and this will most definitely be a budget wedding. As for blogging while engaged: I'm not going to be a bridezilla. In fact, I probably won't have much time to even think of the wedding once the semester starts. I'll update here and there, mostly with decisions we've made, as we've made them (like a venue, whether I'll change my name [hint: I won't], if the dogs will be in the wedding party, if we'll have a vegetarian wedding, etc) but otherwise you can expect the usual from The New Me. Running, writing, recipes, and dogs, with a few wedding updates thrown in here and there. And, from the bottom of my heart, I want to thank you for the well wishes and the congratulations. Marriage is something I never expected to do, so getting excited about it is still a little surreal. But we're definitely excited, and we hope to throw a hell of a party. After ten years together, I'd say we've earned one.